I like having instant noodles back in the Philippines, especially spicy pancit canton. I also occasionally have instant noodle soups, the ones my colleagues and I would have at the end of the day in nearby 7-Eleven. However I have increasingly found instant noodles to be quite salty. 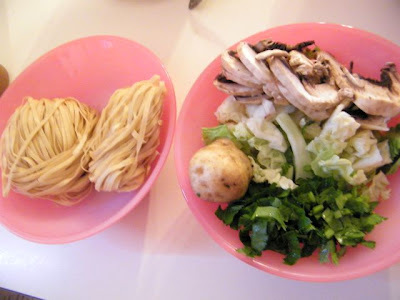 And so when we had roast chicken one dinner and we had the carcass lying there ready for disposal, I found inspiration to prepare my noodles the non-instant way. This is a two-step process. 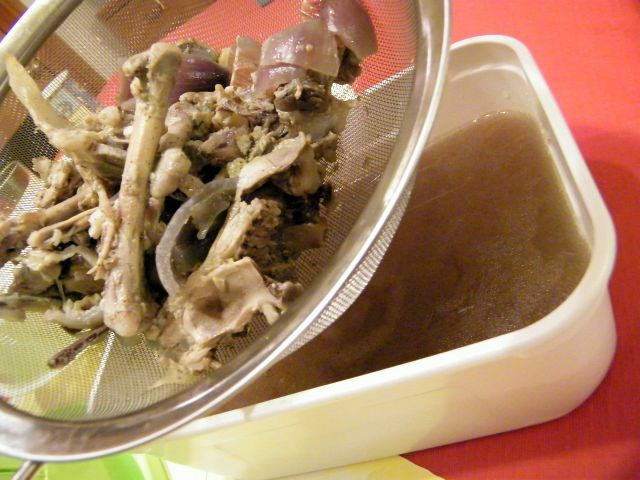 First, make the chicken soup base. And then add the noodles and add-ons. Although this takes a bit longer to make than instant noodles, you will definitely notice the difference in taste (and salt content!). Actually, you can also just skip the chicken soup base procedure and just have some boiling water, cook your veggies in it, then add the noodles and cook for around 3 minutes more. Even that will make noodles more enjoyable. 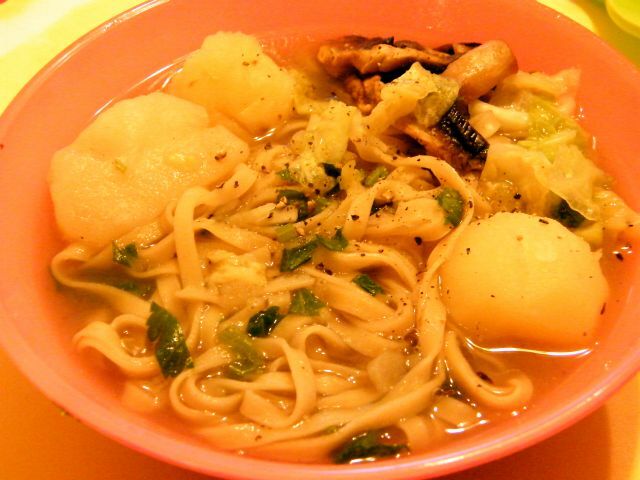 vegetables: a couple of carrots, potatoes, mushrooms, cabbage, broccoli. Chopped. Also celery for added flavour. 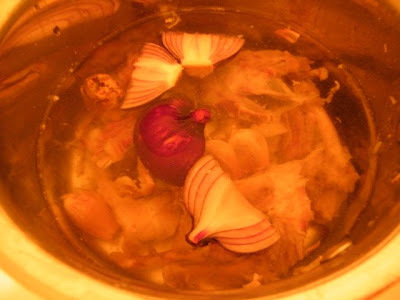 Put chicken carcass, onion, garlic, ginger in water over high flame. When it starts boiling, lower flame and simmer for half an hour. Season with salt and pepper to taste. 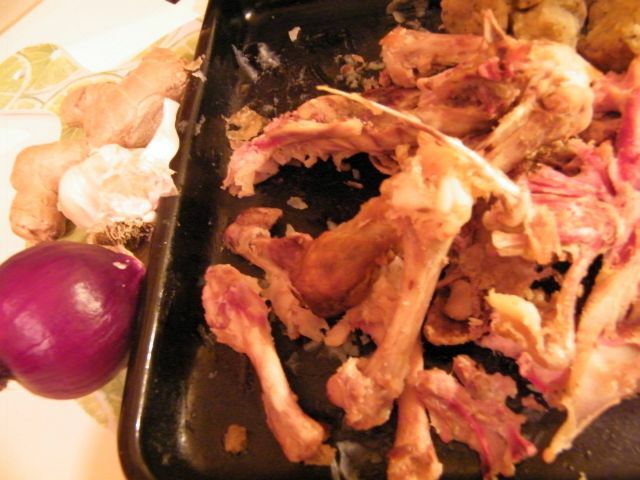 Then drain out the bones and spices to get just the soup. You can actually cool down the soup then freeze it for later use, ideally within a couple of days. If not, on to the recipe! After draining, put soup back on the pot and toss in your veggies. I just rummaged in the ref and was fortunate to find some cabbage and mushrooms. I dug up some potatoes and chopped off some celery from the garden. Place the root crops first so it can cook for around 4 minutes, add the mushrooms halfway through, then add the cabbage right after you remove from heat. The potatoes are especially good at absorbing salt, so you might want to check the taste and season accordingly. Oi Nick! I know what you mean. 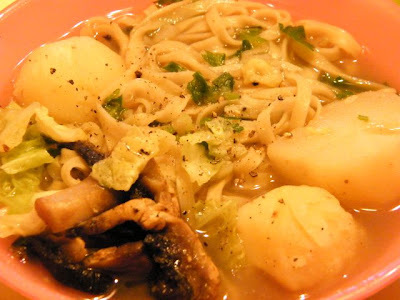 We also make our own noodle soup at home. Even if it's a bit more tedious to make, the results are yummy. Uy Thanks for the tip Bebert! Will try that too! Bespren, kumusta! Are you going to have your food blog as well? I look forward to visiting it!